On the Sulga Bus (you catch it at binario 35 at Fiumicino terminal 3, by the way) to Perugia. 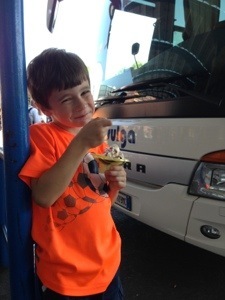 A brief stop at the recently remodeled Stazione Tiburtina in Rome, near the great Roman Porta Maggiore, offers a chance for Micah to try some gelato. The kids have been great. Nearly there!